We are thrilled to announce that we have teamed up with Bitmovin for a strategic partnership in video streaming. This partnership was born out of a common goal shared by the companies: to improve video streaming systems for publishers and bring better streaming experiences to viewers. Peer5 and Bitmovin are not alone in these goals though, we even share partners, including Wowza, to push video streaming forward. Bitmovin offers a fully featured HTML5 based MPEG-DASH and HLS Player with a beautifully designed UI, ready to deliver enterprise quality user experiences right out of the box. The Bitmovin Adaptive Streaming Player has a patented system that constantly monitors the video stream and automatically switches to a smaller and faster profile well before the video stream starts to buffer. This intelligence, coupled with the fact that Bitmovin’s player runs natively in HTML5 (which means the viewer does not require ANY other third party plugins, like Flash or Silverlight) makes the Bitmovin Adaptive Streaming Player the perfect option for a truly user friendly video solution. To get the latest version of the Bitmovin Adaptive Streaming Player, simply register at https://app.bitmovin.com/register. An overview of all relevant information in context of the player, is then shown in the player overview tab, which can be reached by the menu on the left. As you can see in the below screenshot, the overview shows your personal player key and the CDN path of the player files. The first one will be needed later on for setting up a first demo. To use the player on multiple domains, just add them to the list of approved domains within your account. To add a domain, enter the domain name and click the ‘Add new Domain(s)’ button, as indicated in the figure below. For more details on the licensing model and available pricing options, we refer to the our pricing page on our website. Setting up Peer5’s Bitmovin Plugin is as simple as copy-and-paste. First, simply register for a Peer5 account at https://app.peer5.com/register. When you create your account, Peer5 will ask for your website information, then you’ll see the different tiers of service that are offered. But don’t worry, we won’t charge you yet: all Peer5 accounts start with a 14 day free trial. Now that you’ve created an account, you’re ready to get set up. Step 1 is to make sure your server is configured correctly. To work with Peer5, you need to have CORS enabled. You can simply copy your playlist, into our stream tester and we’ll tell you if everything is working. If it isn’t, we’ll tell you why, and show you how to fix it. Step 2 is simply choosing the Bitmovin player. Now you have your Peer5 Bitmovin plugin. 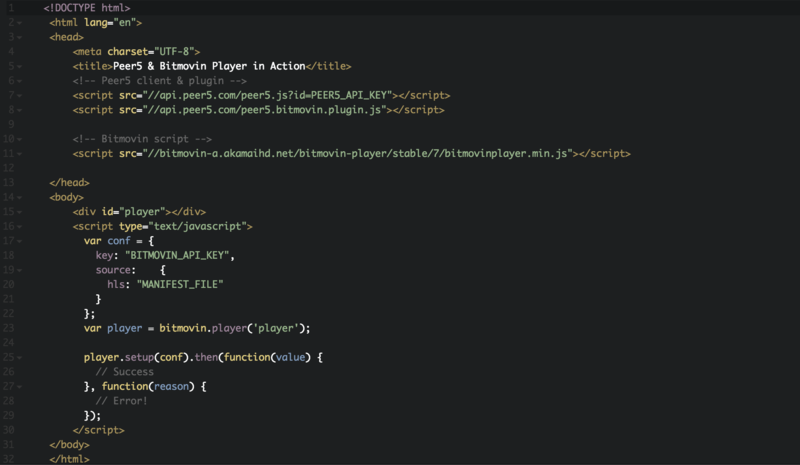 You are just a copy-and-paste to your HTML < head > tag away from enabling Peer5 through your Bitmovin player. For more details about Peer5’s pricing structure, click here to visit our website's pricing page. Please note, that your Peer5 API key has to be pasted at the end of the link to the Peer5 client plugin, as shown in the snippet above. Simply adding this plugin makes Bitmovin’s player seamlessly request your media from peers via Peer5’s peer-to-peer solution while still taking advantage of all of Bitmovin’s features. All necessary actions are taken automatically by the plugins. There is no additional code needed and the player configuration itself can be used without modifications. A possible configuration can be seen in the below snippet. For more detailed information on configuration possibilities, please visit: https://bitmovin.com/player-documentation/player-configuration-v7/. Peer5 and Bitmovin both offer a free and fully featured trial license in order to test our solutions in your environment before being charged. More information about the integration can also be found online at https://docs.peer5.com/players/bitmovin/. The below example showcases a simple usage scenario of the Bitmovin player leveraging the peer-to-peer Content Delivery Network (CDN). Before deploying the script to your web server, simply replace the PEER5_API_KEY and the BITMOVIN_PLAYER_KEY with the relevant API keys and the MANIFEST_FILE with the path to your HLS playlist. By adding yet another seamless player integration to Peer5, we are making it easier than ever to add P2P capabilities to streams everywhere, boosting server scalability and streaming UX. To learn more, check out Peer5’s Bitmovin integration documentation here.